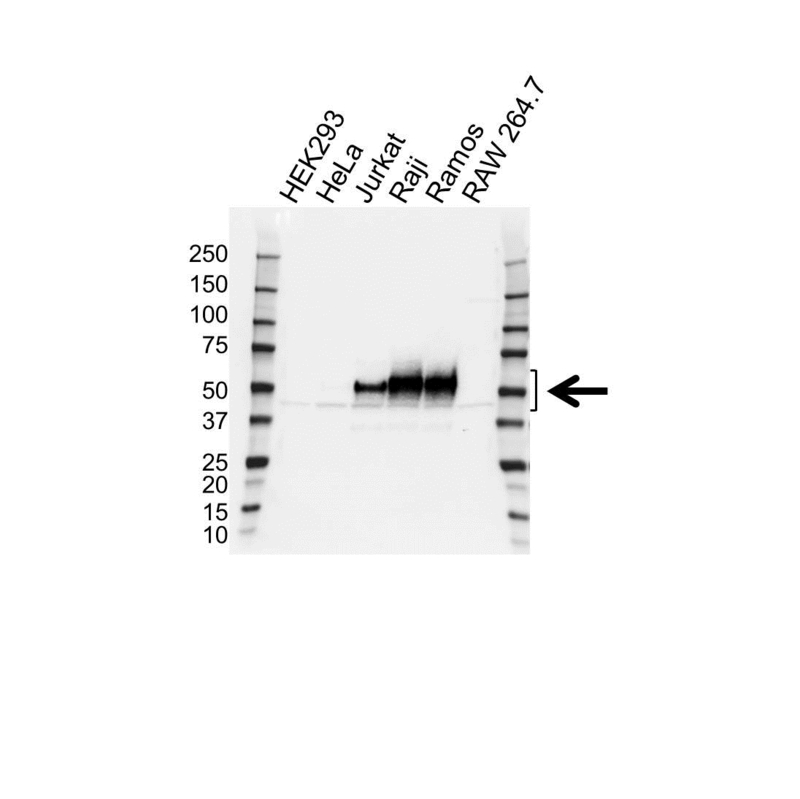 Western blot analysis of whole cell lysates probed with CD79a antibody (VMA00468) followed by detection with HRP conjugated Goat anti Mouse IgG antibody (1/10,000, STAR207P) and visualized on the ChemiDoc™ MP with 42 second exposure. Arrow points to CD79a (molecular weight 45-55 kDa). Mouse anti-human CD79A antibody recognizes B-cell antigen receptor complex-associated protein alpha chain, also known as MB-1 membrane glycoprotein, Ig-alpha, membrane-bound immunoglobulin-associated protein or surface IgM-associated protein. Mouse anti Human CD79a antibody recognizes the B-cell antigen receptor complex-associated protein alpha chain, also known as CD79a (immunoglobulin-associated alpha), MB-1 membrane glycoprotein, Ig-alpha, membrane-bound immunoglobulin-associated protein or surface IgM-associated protein. The B lymphocyte antigen receptor is a multimeric complex that includes the antigen-specific component, surface immunoglobulin (Ig). Surface Ig non-covalently associates with two other proteins, Ig-alpha and Ig-beta, which are necessary for expression and function of the B-cell antigen receptor. The CD79A gene encodes the Ig-alpha protein of the B-cell antigen component. Alternatively spliced transcript variants encoding different isoforms have been described (provided by RefSeq, Jul 2008). Mouse anti Human CD79a antibody detects a band of 45-55 kDa. The antibody has been extensively validated for western blotting using whole cell lysates.